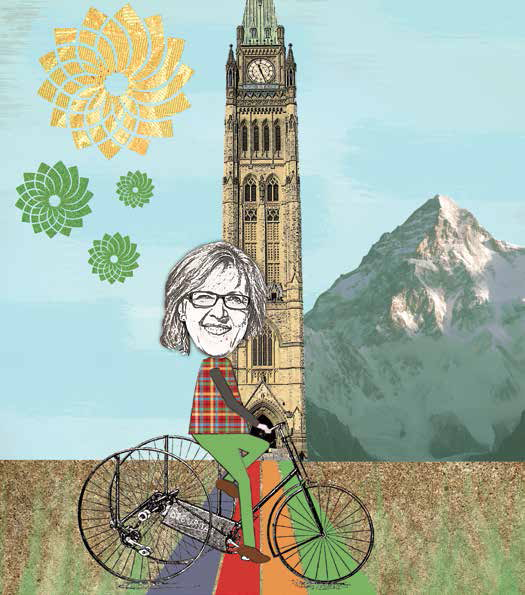 Illustration of Elizabeth May on an old fashioned trike by Jeff Carson, from our new issue. Four years ago, 15 million Canadians took time out of their day to vote in our federal election and four per cent of them chose the Green Party. Proportionally, that should have resulted in 12 seats in our 308-seat Parliament. Instead, the Greens got just one seat. Despite the desires and wishes of half a million Canadians, the Green Party is almost completely absent in our House of Commons. Most western democracies use some form of proportional representation, which ensures that each political party gets their fair share of the seats. What does this have to do with bikes, you ask? While proportional representation might seem to have little in common with bike culture, I would argue that our streets are designed in the same way we’ve designed our parliament. Some voices (like those of pedestrians and cyclists) are often ignored when city builders decide where to place their curbs, sidewalks and painted lines. The result is a streetscape that simply doesn’t reflect the needs of all those who use it. What Canada needs is proportional representation, and proportional transportation! And, arguably, no one has worked more on the dual issues of democratic reform and environmental sustainability than Elizabeth May. Earlier this spring, I spoke with May about both of these important, and unexpectedly similar, topics. Since May has been a strong environmental voice in Canada for decades, I started by asking her how bicycles fit into the larger picture. “Bicycle infrastructure is critical,” she says. “One of the things that a lot of great cities across the world have in common is excellent biking infrastructure. In these cities you’ll see that bicycling is made not only convenient – but safe. It’s a scandal in Canada that cyclists in many cities are taking their lives into their hands to do something good for their health, good for the environment and good for the overall vibrancy of a city. People in cars stuck in traffic jams don’t add to the vibrancy of a city.” But how does the federal government fit into this? After all, it’s up to each city council to decide how they want to design their local streets, not ministers of Parliament. What role can Ottawa play? May quickly offered her support for a private member’s bill that would require putting side guards on trucks to protect cyclists and other more vulnerable road users, but she stressed that the biggest impact the federal government could have was not legislative, but financial. May has spent 40 years advocating for sustainable polices, but her approach has taken many forms. She’s campaigned as a grassroots activist, worked as a political advisor, led a large non-profit organization and was elected as Canada’s first Green MP. I asked her about these different parts of her life and what she’s learned about how they fit together. Later this year, May’s journey will lead her into her fourth election as leader of the Green Party. And once again, we’re likely to see distorted results and an under-representation of Greens in our Parliament. Our current voting system encourages negative campaigns, attack ads and divisiveness – which we will likely see played out in the media this fall. This is yet another parallel to our situation in the streets. 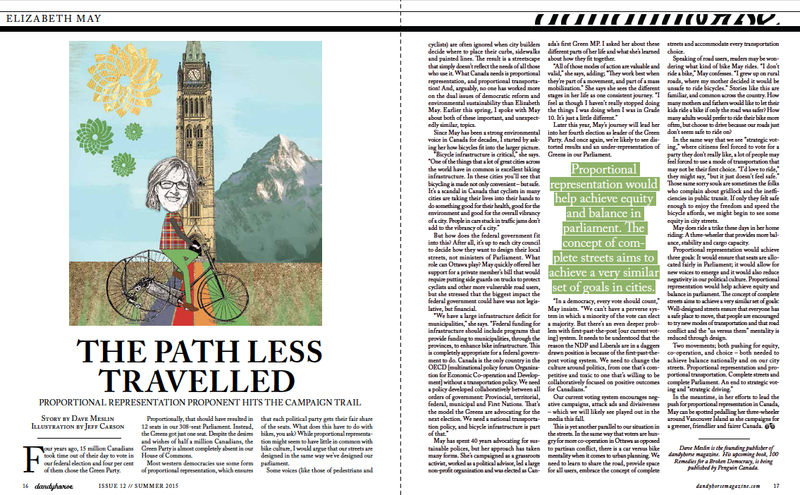 In the same way that voters are hungry for more cooperation in Ottawa as opposed to partisan conflict, there is a car versus bike mentality when it comes to urban planning. We need to learn to share the road, provide space for all users, embrace the concept of complete streets and accommodate every transportation choice. Speaking of road users, readers may be wondering what kind of bike May rides. “I don’t ride a bike,” May confesses. “I grew up on rural roads, where my mother decided it would be unsafe to ride bicycles.” Stories like this are familiar, and common across the country. How many mothers and fathers would like to let their kids ride a bike if only the road was safer? How many adults would prefer to ride their bike more often, but choose to drive because our roads just don’t seem safe to ride on? In the same way that we see “strategic voting,” where citizens feel forced to vote for a party they don’t really like, a lot of people may feel forced to use a mode of transportation that may not be their first choice. “I’d love to ride,” they might say, “but it just doesn’t feel safe.” Those same sorry souls are sometimes the folks who complain about gridlock and the inefficiencies in public transit. If only they felt safe enough to enjoy the freedom and speed the bicycle affords, we might begin to see some equity in city streets. May does ride a trike these days in her home riding: A three-wheeler that provides more balance, stability and cargo capacity. Proportional representation would achieve three goals: It would ensure that seats are allocated fairly in Parliament; it would allow for new voices to emerge and it would also reduce negativity in our political culture. Proportional representation would help achieve equity and balance in parliament. The concept of complete streets aims to achieve a very similar set of goals: Well-designed streets ensure that everyone has a safe place to move, that people are encouraged to try new modes of transportation and that road conflict and the “us versus them” mentality is reduced through design. In the meantime, in her efforts to lead the push for proportional representation in Canada, May can be spotted pedalling her three-wheeler around Vancouver Island as she campaigns for a greener, friendlier and fairer Canada. Dave Meslin is the founding publisher of dandyhorse magazine. His upcoming book, 100 Remedies for a Broken Democracy, is being published by Penguin Canada.